On June 19, over 1,100 soldiers from seven NATO countries gathered at Camp Ādaži, northeast of Riga, to mark the stand-up of NATO’s enhanced forward presence battlegroup in Latvia. 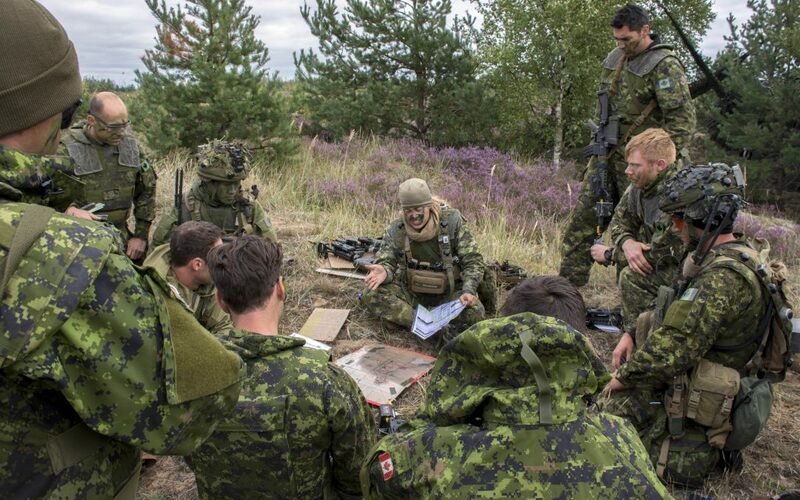 Two months later, on August 27, the Canadian-led formation completed a certification exercise and was declared interoperable and combat effective to meet NATO strategic directives. 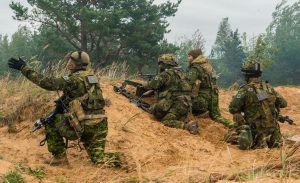 The battlegroup, comprised of around 450 Canadian soldiers alongside contingents from Albania, Italy, Poland, Slovenia and Spain, is one of four multinational enhanced forward presence battalions holding a defensive posture across the Baltic region, in Latvia, Lithuania, Estonia and Poland. Under the command of LCol Wade Rutland, it will operate and conduct exercises with the Latvian Land Forces Infantry Brigade. While the stand-up went off without a hitch, assembling the multinational battlegroup was no easy task. It’s been decades since Canada last conducted such a large-scale mission in Europe. As BGen Jennie Carignan, just months into the job as the Canadian Army’s Chief of Staff, Operations, found as she shuttled between cities to negotiate troop contributions, equipment, rules of engagement, and other logistics, the Canadian Army needed to relearn Europe. It might seem like a small negotiating point, but when you’re assembling a multinational battlegroup, meals really matter. Coalitions wrestle with network and equipment interoperability, differing rules of engagement (ROE), and force-specific tactics, techniques and procedures (TTPs). When the Canadian-led enhanced forward presence battalion (eFPB) was being formed, the original plan had been for each nation to provide its own kitchen. Planners soon realized, though, that it would be a collective drain on limited resources, prompting delicate negotiations to reach a compromise on a single kitchen. How to feed a thousand soldiers was just one on a long list of items that had to be resolved before the battlegroup deployed to Latvia in early June. 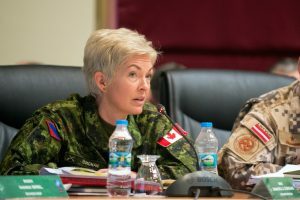 While Canadian Joint Operations Command (CJOC) and the Strategic Joint Staff, respectively, initiated discussions with the host nation and drew up the terms of a technical agreement with the contributing countries, the Army worked with the other framework nations – the United States, the United Kingdom and Germany – and with all the participating militaries to design a force package with the appropriate force posture for the mission. Between mid December 2016 and April 2017, Carignan accumulated hundreds of frequent flyer miles, travelling between Ottawa, Izmir, Berlin – where she narrowly missed the December 19 truck attack on a Christmas market that killed 12 people and injured 56 others – and Allied Joint Force Command Brunssum in the Netherlands. The Canadian Army is much less familiar with European operations than it once was, she discovered. The last soldiers of 4 Canadian Mechanized Brigade Group returned from Lahr, Germany in 1993. And although Canadian task forces have been conducting operations and exercises with counterparts in the Ukraine and, more recently, Poland since 2014 as part of Operation Reassurance, amassing the components of a battlegroup to operate on European soil had a steep learning curve. “I realized going back that we didn’t know Europe very well any more,” she said. “We had to relearn a lot about the context, about the dynamics, and about the Baltics – that’s a new theatre. We have a tendency to think we know Europe very well. No, Europe is a completely different scenario, a completely different operating environment than North America. Each country in the battlegroup has a distinctive relationship with Russia and its own perception of the threat Moscow poses, but that range of perspectives has contributed to a well-informed debate about how best to structure the response. The Canadian-led eFPB is also the most multinational of the four. And while Spain, Italy, Poland, Albania and Slovenia are NATO members and adhere, to a large extent, to NATO standards, Canada has never collaborated at this level with any of them. Italian and Spanish troops served alongside Canadian forces in Bosnia – as an engineer, Carignan worked with explosive ordnance disposal experts from both countries – but none of the partners have been fully integrated together as part of a multinational battlegroup. All six militaries will have staff in the battlegroup headquarters and liaison officers have been exchanged to resolve differences and manage language barriers. The fact that everyone is sharing the same kitchen will also ensure there is a lot of interaction, she added. Preparing the infrastructure to support a large battalion was “done at lightning speed” by the Latvian military and government, Carignan said. The larger challenges revolved around force structure and ROEs across the four NATO battlegroups, each of which has a slightly different mix of assets and a different rotation schedule. Negotiating troop contributions was far less difficult. While there was some back and forth to ensure sufficient tanks, indirect fires and other critical assets, countries offered enough capability to leave few gaps. As the lead nation, Canada provided the core of a headquarters staff, a mechanized infantry battalion of light armoured vehicles, a reconnaissance element, military police, and logistical and communications support. Spain, the second largest contributor, has contributed a mechanized infantry company, combat engineers and a logistical support element. Both Poland and Italy are providing troops and fighting vehicles. The Polish contingent includes a tank company and a logistical support element; the Italian contingent consists of a mechanized infantry company. Slovenia’s contribution includes various specialities and a logistical support element, while Albania has provided specialized engineering capabilities. “When we see there are pieces missing, we play with the flexibility we have inside our position to have the proper troop organization,” said Carignan. As an example, Canada has deployed an artillery battery of four M777 Howitzers and approximately 100 personnel from the 1st Regiment, Royal Canadian Horse Artillery, to participate in various training exercises, including Exercise Silver Arrow in October. While the guns will remain in Latvia throughout the mission, the soldiers will return to Canada between exercises. The battlegroup will link into the Latvian brigade’s exercise cycle, which in turn is part of a larger NATO training program. To date, the Army has not requested any specific modifications to meet Canadian training objectives, Carignan said. The Canadian contingent, however, has had to brace for the onslaught of online and social media harassment, reinforcing some of the scenarios that were presented on Road to High Readiness training during exercises like Unified Resolve. Just as the eFPBs have adopted a defensive posture physically, the battalions have also had to establish a defensive cyber posture.